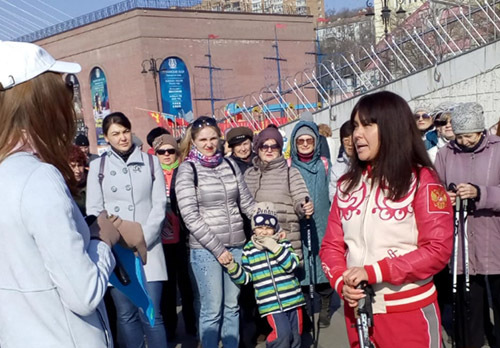 Special television project GTRK "Vladivostok" "Discover Primorye". Tourists can explore "Slavic beach" project. The first extreme sportsmen this year already reached in the open sea, while others and does not close the season, in the winter prepare for the summer pool underwater expeditions. The purpose of the route is sea stones near the island Tarantseva, it is a popular place for larghas rookery - Far Eastern seals. This is the team of the freedivers who intend without the special equipment on a single breath to dive into the world of the sea inhabitants. Yuriy Karnatsky, freediver, "My partner said to me:" Have you not noticed that there is the shell where we swim? " I said, I noticed it, but it very cool, that you can see what things are nearby you when you swim through. " The instructor Tatyana the third year teaches everyone the basics of freediving. Everybody can have special training get the original diving skills just on one breath,. Freediving or underwater yoga. Dive to a depth of 15-20 meters from the breathhold passes along a special rope. The residence time in the water - a maximum of two minutes. This is enough to see the beautiful underwater world of the Primorye.